Grasshopper Soccer is an organisation that aims to teach and develop soccer skills among children in a safe and enjoyable environment. Our programs are designed for children aged 2-12 years. Each program progressively provides a building block upon which children can improve on their game and character. At Grasshopper Soccer, we run our programs the whole year, both on weekdays and weekends. We offer programs during the school term and also during holidays through our holiday programs. 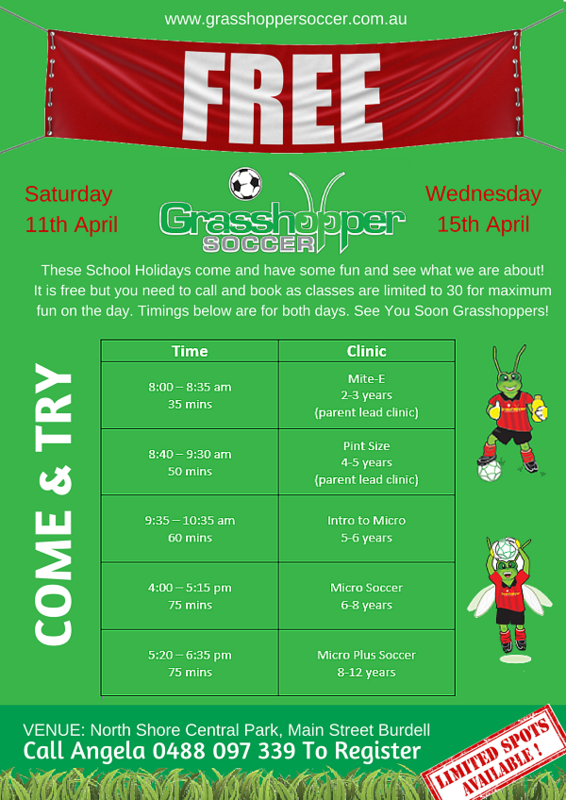 Grasshopper Soccer is BRAND NEW in Townsville and to celebrate and introduce everyone to what we offer we are have two FREE Come and Try days these School Holidays. Come along and let the kids have some fun while expelling some energy – outside! We are setting up our Burdell Centre behind where the Farmers Markets are held (Central Park) at North Shore, Main Street Burdell.